More/larger pictures available from NSF or Raytheon (archive). Physician Ron Shemenski, age 59, passed a gallstone and had pancreatitis, NSF announced on 11 April 2001 (all dates/times on this page are EDT/GMT-4 which is 16 hours behind Pole time). Subsequently the New York Air National Guard was mobilized for a medevac mission...after 2 aircraft made it to Hawaii the decision was made to recall them and go with Twin Otters chartered from Ken Borek Air. Two of these aircraft went south from Calgary via Ecuador to Punta Arenas and Rothera. They arrived at Rothera on 21 April and waited for good weather until 24 April when one of them flew into Pole arriving at 2000 with the replacement doctor Betty Carlisle on board. After resting for awhile and having delays defrosting the aircraft, the Twin Otter left Pole the next day, arriving back at Rothera at 2052 25 April, and continuing on to PA the next day. When Doc Ron arrived back in Denver he went in for gall bladder surgery but ended up having heart surgery instead. He went home to Ohio to recover, but later returned to Denver to go back to work at RPSC, and finally to have his gall bladder removed in late June. Early April: Dr. Ron Shemenski has abdominal pains and passes a gall stone. Although he swiftly regains health, NSF initiates medevac planning based on the potential for a relapse later in the winter when medevac would be impossible. 12 April: NY Air National Guard aircrews left their base in departed from Schenectady, NY for Christchurch and McMurdo to prepare for a medevac. 14 April:...the National Guard LC-130's are recalled from Hawaii. NSF decides to go with Twin Otters, which unlike the large aircraft have much simpler control systems and nonhydraulic landing gear (fixed skis...) hence a lower temperature rating. They departed from Calgary today. NSF press release. 21 April: The aircraft left Punta Arenas at 0645 for the 6-hour flight to Rothera, They arrived safely at 1230. The plan is for one aircraft to make the flight to Pole, with the other remaining as backup at Rothera. Meanwhile, Ron felt fine and didn't want to leave, according to Canadian Polies John and Jennifer Bird. 22 April: Twin otters wait at Rothera for good weather. 23 April (Monday): Another day's delay (Antarctican.com archive). 24 April (Tuesday): After waiting 3 days for improved weather, the medevac twin otter left for Pole at 1034 EDT (0234 25 April Pole time) with a crew of 3 plus Dr. Betty. They landed safely at 2004 EDT (1204 SP time) (NSF press release and USA Today report). Weather: calm winds and cool temperatures...-92°F (-69°C). 25 April (Wednesday): After the scheduled 10-hour on-deck time is extended due to weather concerns and difficulties thawing the aircraft out (and breaking the frozen skis loose from the snow surface) Doc Ron's flight left at 1247 EDT (0447 Thursday SP time) and arrived back at Rothera at 2052 EDT. 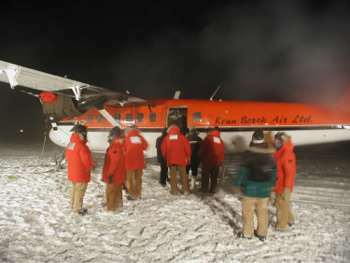 26 April: Both twin otters left Rothera at 1120 EDT, arriving at PA at 1555 (NSF press statement and USA Today report). 27 April: After meeting the press in PA (CBS News report), Ron headed for Denver via commercial airlines. 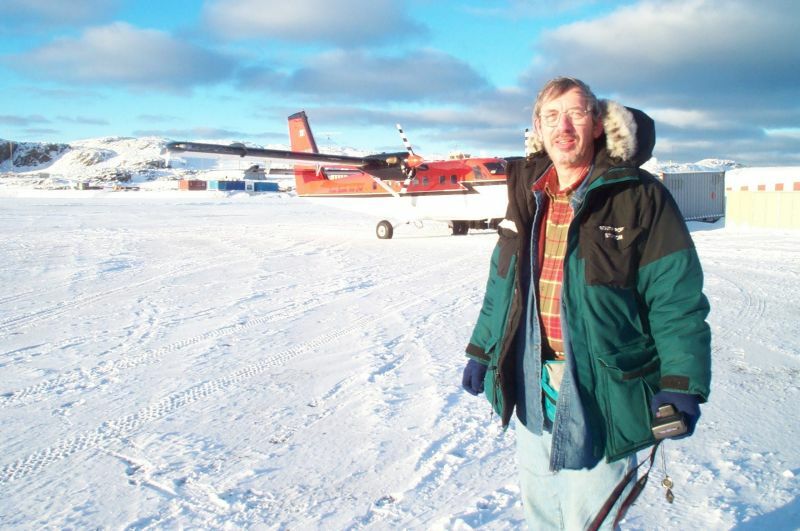 28 April: Sean Loutitt, the Calgary pilot, described the flight to Pole in a detailed interview in the National Post. The landing was no problem, he said, and the flight crew was treated to a fine meal. He even bought a T-shirt. Meanwhile, Doc Ron already misses his colleagues. 2 May: Ron is hospitalized for gall bladder surgery scheduled for Thursday 3 May at the Swedish Medical Center in Denver, but preoperative tests indicated he'd suffered a mild heart attack. This probably occurred at Pole last December, when he experienced chest pains and flu-like symptoms. 3 May: The gall bladder surgery is postponed, instead there was a cardiac operation; two stents were installed in coronary arteries. 4 May: He was discharged Friday and headed home to visit family in Ohio. 30 May: Ron was scheduled to go back to Denver for gall bladder surgery in early June, and then return to work at Raytheon. 29 June: Ron finally has successful surgery to remove his gall bladder, this at the Swedish Medical Center. NBC's Bob Arnot has left Punta Arenas, and CBS's Jerry Bowen has left the room...since you're here you know that the best stories of what really went down at Pole come from the w/o folks who endured the sleepless nights and hard work required to pull it off successfully. SPARCLE scientist Stephen Hudson has an amazing photo series of the landing (archive site). Met guy Nathan Tift has both a diary entry and photos. And he ought to know what the weather REALLY was...-92°F (-69°C) and calm winds. Dana Hrubes has the story and photos in his April journal. Electricians Aaron Coy and Dave Arnett have a feature story with photos on the IBEW web site and journal. John and Jennifer Bird have a few good pics (some of which made the papers), and Amanda observer Steffen Richter had some great photos and video of the takeoff attempts. Last but not least, Charles Kaminski chronicled the events in his excellent South Pole Charlie 2001 diary, also no longer available.